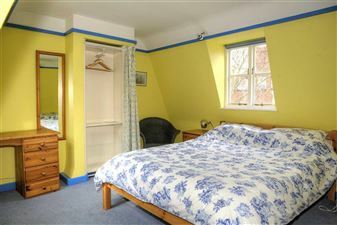 Price:625-£650 per week or £90-105 per night. Prices greatly reduced for longer term bookings for guests such as Visiting Scholars, etc. Linen, towels and all services included. Plus Internet broadband. The flat is split over 2 floors. 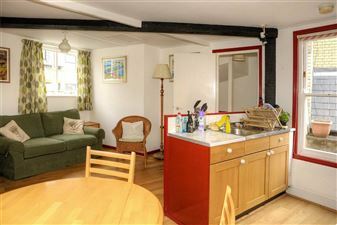 The first floor contains a kitchen/dining area at one end and a living area at the other. 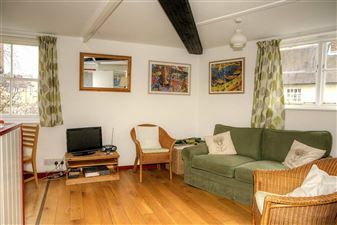 There is a double sofa bed in the living area. The room is very light, having 3 large windows. On the floor above the living area there is a large room with 2 windows. It has a large king sized bed and there is still a lot of room for a single bed should you need one. Next to the bedroom, is a shower room and toilet. The shower is very powerful and there is a heated towel rail. It is not ensuite and therefore neither bedroom is disturbed when visiting the shower room/toilet. At the end of the main bedroom is some extra wardrobe space behind the curtain (see picture below).